There have been a lot of cards recently that really are at their best when you’re just a little behind in the game. Teammates, the Ultra Beast Necrozma-GX, Buzzwole-GX to a degree, Counter Energy – the list goes on and on. But it’s not exactly a new trend in the game; in fact, veterans will likely recognize that there are cards that had these kinds of effects well before then! Black Belt is a Supporter from Triumphant with a simple effect: if you’ve got more Prize cards than your opponent, you get to dish out 40 more damage to your opponent’s Pokemon this turn. Imagine pairing this with Choice Band or even just Muscle Band! You’re suddenly dishing out 60-70 more damage in one turn, which makes even the weakest of attacks look massively imposing! Thankfully for Standard play, this card hasn’t been reprinted, and it got cut off so it never made a showing in Expanded. However, if you’ve played the PTCGO-exclusive Legacy format, it’s likely you’ve run into this card in some form or another. And it wouldn’t surprise me if it’s managed to tip the scales in some manner; unlike a few of these “catch-up” cards, Black Belt gives the player a chance to completely overwhelm their opponent in a single move, provided they have the right Pokemon set-up and ready to go for it. …mustard been real hard to come up with a ketchup-mustard pun. Yes, yes it was. It was worth it. Arora Notealus: Black Belt’s definitely a card which had a lot of power, even with its restriction. If anything, having that restriction is what made it balanced, as just having so much damage put on otherwise would have been an instant 4-of and could’ve made games go way too quickly. Just imagine looking at your opponent’s Pokemon and thinking, “Oh man, I’ll survive with 40 HP left and win the game.” And then they play this and steal the game from you. That’d be just terrible. I don’t think anyone would’ve liked that anymore than if they could relish in any more condiment puns…but that don’t mean I can’t throw another one in when you’re looking right at me HAH!! Side Review: Pal Pad – Supporters like Black Belt or Cynthia can be some of the most pivotal cards in the game at times, so having Pal Pad around to recycle them as need be is great. This card was originally printed in Flashfire and had rotated out for a while, but with its recent reprinting in Ultra Prism, it’s now available again to players who want to be able to reuse some of their best cards again. Course they do go back in the deck, so it might not be immediately useful…which can be detrimental if you draw it instead of something you need. Such is the risk we run with such cards. Next Time: The absolute largest selection of cards reviewed in a single day! Today we look at a card that is still legal in the PTCGO-exclusive Legacy Format, Black Belt (HS – Triumphant 85/102). It originally reviewed a little over seven years ago, and re-reading my own review from that time makes me cringe; the short version is that I was so disconnected from anything resembling competitive play that I didn’t even know it, which might be why I awarded this card its highest scores. Which isn’t to say that Black Belt is a bad card; rather, it is more specialized than it looks owing to the metagame. Gaining +40 to the damage done by your Pokémon’s attacks to your opponent’s Actives is big now, so it was a bit more impressive back then. It even applies before Weakness and Resistance, acting as a +80 or +20 bonus, respectively. What held Black Belt back is the combination of other potent Supporters, and its requirements proving more burdensome than I had realized. This card released at a time when decks were shifting to Supporters as their primary form of draw power, so giving that up for a damage bonus was difficult. It also hurt that Black Belt could not be played, even for a reduced effect, when you didn’t have more Prize cards remaining than your opponent. While this was good for game balance, as a player couldn’t hope for a lucky donk (T1 attacks were legal when this card released) or fuel general aggro decks, it also meant a deck needed to fall behind early on while still having a good but not great offense later on. If the deck got ahead too quickly, Black Belt would to waste (and probably wasn’t needed in the first place). If the deck hit so hard that +40 damage was unneeded or not hard enough for +40 damage to matter, even if it was the kind of deck to fall behind in Prizes, Black Belt wouldn’t help. Throw in that Prize cards are an unreliable means of determining who is truly ahead until a player takes his or her final Prize, and you can see why Black Belt didn’t score so high according to anyone else. I haven’t even gotten to another key factor; Twins! Similar to Teammates, Twins allowed you to search your deck for two cards and add them to your hand; unlike Teammates but just like Black Belt, it could only be used while you had more Prizes left in play than your opponent. It also worked well with slower decks, the kind most likely to go down in Prizes, and unlike Black Belt, didn’t care if the main strategy was beatdown, control, or mill. Thanks to Tapu Lele-GX, a reprint of Black Belt might actually be worthwhile in the Standard and Expanded Formats, especially the latter where VS Seeker is also legal. I won’t officially be scoring for those formats, but as a hypothetical, Black Belt might be a three-out-of-five for Standard and upwards of a four-out-of-five in Expanded! In the unlikely event you can use HS – Triumphant packs for Limited Format play, not only are you lucky to have any Supporter most turns, but even with all the conditions +40 damage will likely do even more for you here. As for the Legacy Format, it lacks tricks like Battle Compressor, Tapu Lele-GX, VS Seeker, etc. but it does still have Jirachi-EX. I haven’t found a really, really good deck that can use Black Belt yet, but I’ve definitely had situations where I wish I had space in my deck to have included it. Today’s Throwback Thursdays is Black Belt from HS Triumphant! It was reviewed by the review crew at November 5, 2010 (https://www.pojo.com/COTD/2010/Nov/5.shtml) This Supporter card is another coming-from-behind cards because this card works only if you have more prizes than your opponent. When you are behind on prizes, your Pokemon’s attacks do 40 more damage to your opponent’s Active Pokemon (before applying Weakness and Resistance). At first glance, this seem like a bad card; you’re giving up other Supporters which could draw you more cards, and the damage Boost can be taken care of via Choice Band. Well, Black Belt bypasses item lock and Trashalanche, and you could even argue that this is the only Supporter in your hand. This is one sizeable boost that is not restricted to certain targets unlike Crystal Edge or even Choice Band; It can hit any Pokemon. This also saves you from devoting even more resources to perform the same task; Flareon/Vespiquen (backed with Base 20 damage Black Belt and Choice Band) will need 16 Pokemon in the discard pile. Which is still a lot, but at least it’s not 20 or above. If this card were to be legal, I can imagine it may be a loose staple, something to surprise your opponent by throwing extra damage out of nowhere to swing the game around, especially if your opponent overextended their resources on one Pokemon. If you have two prizes left, but your opponent has one, and you KO a EX/GX with the help of Black Belt, you win! Legacy format is on a similar boat, with EX Pokemon giving 2 prizes, you can actually go for a revenge KO and win, something that was rare back then due to both players down to one prize left. Legend cards (like Rayquaza & Deoxys Legend) still give 2 prizes, but such a mechanic is few and far between. Today’s Throwback Thursday is a bit of a surprise – a well known predecessor of a card which sits in a position of “I’m used but not THAT much used” scenario. A peculiar one indeed. And it’s none other than Black Belt! Back in the HGSS era of PTCG, Pokemon loved to spew out these new Supporters which works only when you are able to manipulate your prizes so you need to take 2 prizes on your final turn, a feat which might seem impossible but it was actually possible. One such Supporter which works by the prizes was the very powerful Twins – a card which allows you to search any 2 cards if you are behind on prizes, a very easy option to do because of the multiple options you have to do so between low HP starter Pokemon like Cleffa or just chucking any weak Pokemon as bait, hoping that it will not survive the hit from the opposing side. Used properly, the turn you used Twins can be the turn you win the game. So how does Black Belt work? Well, like Twins, it is only playable if you’re behind on prizes. What it does is that it boosts your Active Pokemon’s damage by 40 on this turn. Reminds you of a current card? Yes, this is Professor Kukui (SM Base) which deals double the boost but can’t be used on a whim. This was more a comeback card, and for a very good reason. And that reason, is Expert Belt. This nifty very popular Pokemon Tool allows the wielder to deal 20 more damage and have 20 more HP, and with the power creep not being as strong as today’s, 20 extra damage was mo re than enough to pretty much support OHKO a majority of the most meta-defining Pokemon of the day. However, when your Pokemon that has the Expert Belt is knocked out, it turns that Pokemon into a pseudo Pokemon-EX or Pokemon-GX on which they take 2 prizes instead of one. 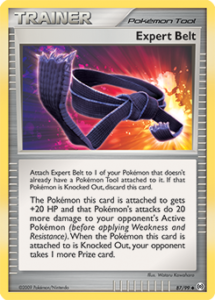 This can be effectively played in your favor; you use the Expert Belt to secure a 4-5 prize trade to use Black Belt or Twins, and when you’re ready to take the knockout, a Black Belt usage plus Expert Belt will deal an additional 60 damage to your opponent’s Pokemon, making attackers such as Donphan Prime (HGSS Base Set) able to deal 120 for 1 Fighting Energy with Earthquake, OHKOing most Basic and Stage 1 Pokemon of the day. It was mad, and the loss of draw you use from using Black Belt can be easily mitigated by the prizes you take after defeating your opponent. The Black Belt + Expert Belt combo was often used in 1 energy attacking decks like Donphan Prime and it secures similar cards to be top tier threats. However, there still are issues from using Black Belt. 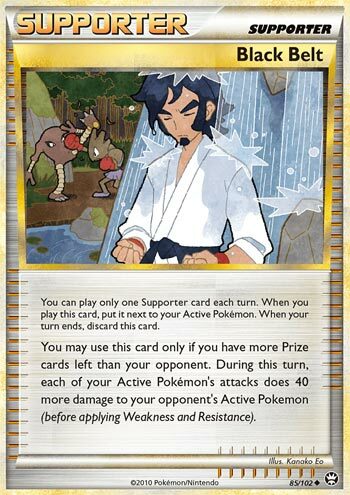 First, and as explained earlier, you don’t draw cards with Black Belt, meaning it faces heavy competition as a Supporter for the turn with stuff like Twins and especially Professor Oak’s New Theory which was the biggest deal at the time. Secondly, Smeargle (HGSS Undaunted) was one of the premier starting Pokemon of the time and it can copy your Black Belt when you’re not careful. Because of the nature that using Black Belt means that you need to either preparing for a knockout as you predicted your current Pokemon will be knocked out and its more a revenge kill method, your opponent can just copy it for free when they are currently behind on prizes and deal an extra 40 damage themselves. As a result, you can only use Black Belt exclusively as a revenge kill card, which isn’t ideal when you want to gain ground very quickly – which is what most of these cards are most suited to, such the Expert Belt tool mentioned above. Lastly, if you just wanted more damage, there are much better options than Black Belt – the same era provided us with the amazing PlusPower + Junk Arm combo which can do almost the same thing as Black Belt (albeit 10 damage short) which is not just more reliable and can be used anytime but doesn’t take up your Supporter slot for the turn which you can use to draw cards. In short, Black Belt can, and has the potential to be a good card. However, its criteria denied it from being a good card, a mistake Pokemon finally rectified about 7 years later. And it still sucked, even with help.